You can listen to 'Northern sky' here. 'Mister and Mississippi' is a song by Irving Gordon from 1951, made popular by Patty Page, the recently deceased singer of the unforgettable song "Doggy in the window". However, Mister and Mississippi is also the name of a new Dutch band, whose members met at the Herman Brood Academy. Musically Brood and this band could not be further apart, but the fact that musical education academies start to bring forth new bands, is a good sign. The Fudge is such an example and now Mister and Mississippi. Musically both are far apart, eclectic punky sympho rock versus singer-songwriter music in a band setting, both are at an extremely high level. At first listen, on the radio, I did not get the song. Probably I listened to fleetingly or was distracted, but when 3FM dj Giel Beelen tweeted recently that Mister and Mississippi was the best band at present, I decided to give the band a chance and put on the album. I have to say I played the album a lot since. Still, Mister and Mississippi is not an album that won me over easily. It is not an "easy" album. It is mostly quiet, with somewhat dark and brooding songs. Songs with long and languorously held tones and notes. Floating sounds like flying carpets or birds of prey turning their rounds on air currents above mountain tops. Slow and deliberate. 'See me' is such a song of majestic beauty, unassailable almost cold. 'Same room, different house' which is a more filled out song, comes almost as a release. A party song, in its sort that is. Guitars that are allowed to rock out and build the song into an anthem. This means that most songs on this album do not give their beauty away in one or two listens. Slowly I started to appreciate this album more and more. Playing it under different circumstances, while in all the album kept its ground and became more dear to me. 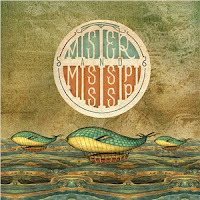 Slowly it crept up on me and I started to realise that Mister and Mississippi was not just an ordinary debut album, but a joining of a force of talents. The dual lead singing of Maxime Berlag and Samgar Lemuel Jacobs works beautifully. Both take turns at the lead and harmonise (with guitarist Danny van Tiggele as well) lending the album a dreamlike quality. I can imagine hearing a song like 'Coloured in white' being sung in a church with a big choir. The singers play percussion in turns, although percussion is not present everywhere on the album. Guitars are and they are played by van Tiggele and Tom Broshuis. As such Mister and Mississippi is not your average band. People who are to go and watch the band live are advised to go there to listen. Talk through a show and there will not be a lot left to enjoy. Mister and Mississippi is all atmosphere and no rock. Delicate phrasing, beautifully intertwined vocals and guitars. Just in time the band offers release in the form of a climax to 'Northern sky' or 'Circulate'. Monumental and static. I find that I can hardly compare this album to anything else. Not that it is totally unique, it's more that the way the band plays on this album, makes it fairly unique to me. Or perhaps I do not really like any other bands that operate in this segment? 'Follow the sun' comes close to Mumford and Sons, most because of the kick drum, after that the band takes a departure in a completely different direction. Blaudzun because of the atmosphere, but also not so much the music. 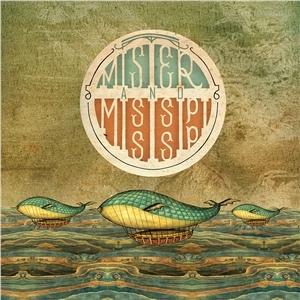 Mister and Mississippi is an adventure, but also a sign of another new Dutch band that deserves attention and a following. There is a lot of talent in our country, perhaps not unlike in the mid 60s, when from everywhere pop bands sprouted with each unique features that made them stand out. For the first time in my life I find myself going to a lot of Dutch bands live and having a very good time. There's one difference. My older friends tell me that in the 60s bands could play at a lot of venues in inner cities. That infrastructure is all gone. The growth potential for gaining experience of bands in the 10s is a lot smaller, the possibility to be heard nationwide (radio/tv/Internet) a lot bigger. Mister and Mississippi already have that part down. Now it's up to the band to show that they can also deliver live in front of an audience that expects more now that there is a very good album under the belt. You can listen to Mister and Mississippi by Patti Page here.